This Baby Philadelphia Derringer measures only 6.5" and is similar to the piece that John Wilkes Booth used to assassinate President Lincoln in Ford's Theater in 1865. 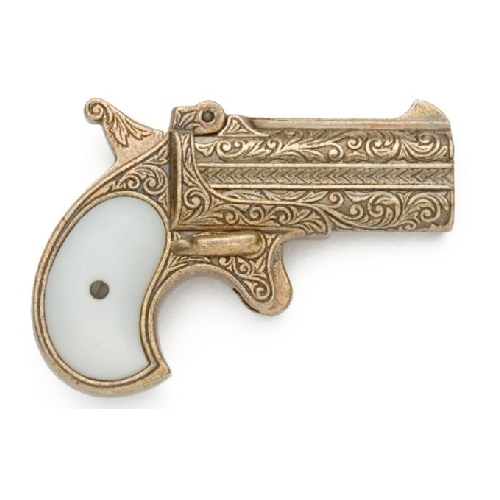 It was a favorite hideaway percussion pistol of gamblers and card sharks, easily concealed in a coat or boot for use if the game turned sour. The M1869 .45 caliber Schofield Single Action Old West Pistol was a favorite of the U.S. Cavalry, stagecoarch agents and Frank James. 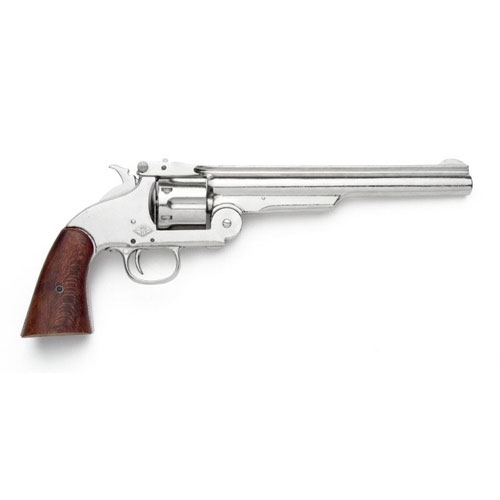 This replica gun is a frontier classic that features an 8" barrel and shiny nickel finish. Its unique break-open action makes for easy reloading. It was also favored by the Czar for Russian troops. Wyatt Earp is said to have carried a similar version of the historic replica. This unique revolver was developed in London during the mid 1800's. This replica gun features 6 mechanically revolving barrels, an engraved simulated brass receiver stamped 'London', and wood grips. Length: 8.5" Weight: 2 Lbs. This USA M1873 cavalry single action replica revolver has a 7.5" barrel and action that works like the original. This military collectible has an antiqued gray finish and comes complete with wood grips. This replica gun looks like it just came of the plains of the frontier. 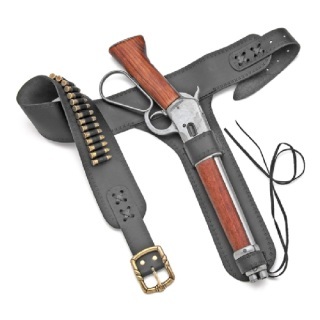 Length: 12.5" Weight: 2 lbs. 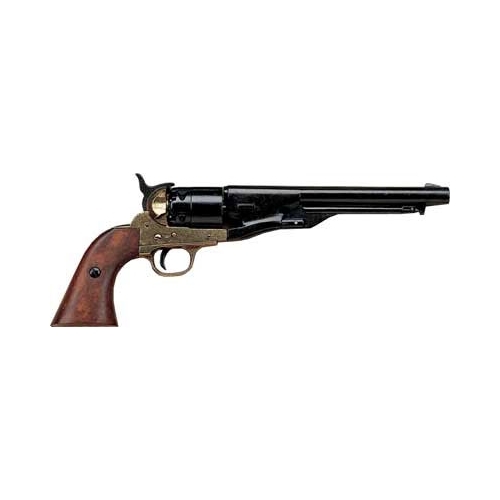 This M1873 replica gun captures the classic feel of an Old West cavalry single action revolver and has a 7.5" barrel. This military collectible has an action that works like the original. This replica gun has a shiny nickel finish and comes complete with wood grips. This model gun looks like it just came of the plains of the frontier. Length: 7.75" Weight: 1.2 Lbs. 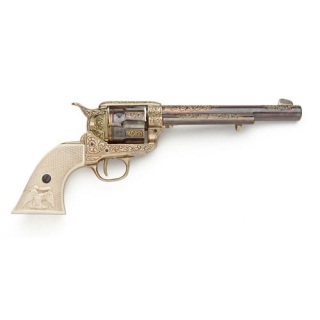 This .31 caliber small frame dragoon was used during the Gold Rush, Civil War, and Old West Eras. Our hideaway replica gun measures 7.75" in length and has a 5 shot rotating barrel, 3" metal octagonal barrel and wood grips. 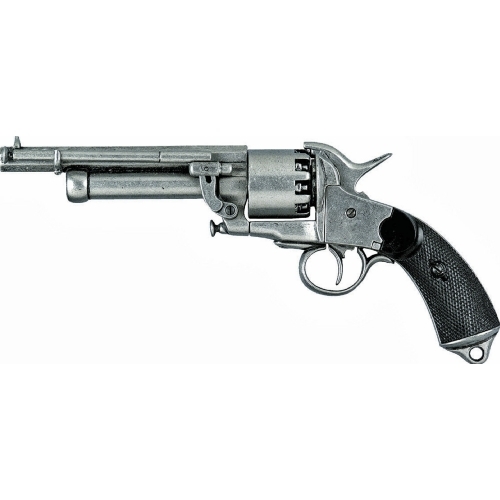 Designed by William Elliot, this famous .41 caliber, two-shot, single-action derringer was manufactured for over forty years. The hinged barrel of this replica gun swings upward for easy reloading. 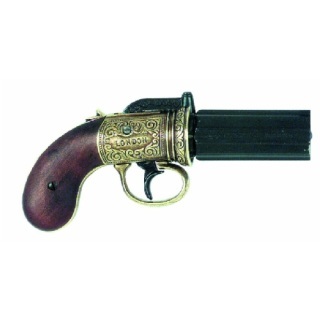 This Old West collectible has engraved barrels and plastic grips. Lenght: 4.75" Weight: 1 Lb. This legendary fast draw, single action, replica model gun has an antiqued gold finish, elaborate leaf engraving, and wooden grips. The action on this military collectible works like original. 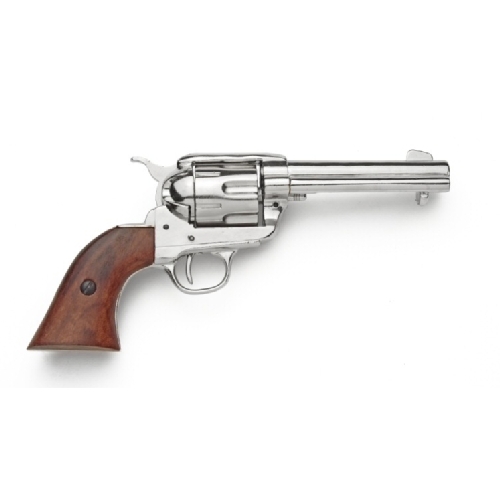 This famed M1873 Cavalry Model single action revolver has a deluxe silver finish. The 7.5" barrel of this replica gun is finely engraved. The single action works just like the original. This piece is complete with simulated ivory grips. 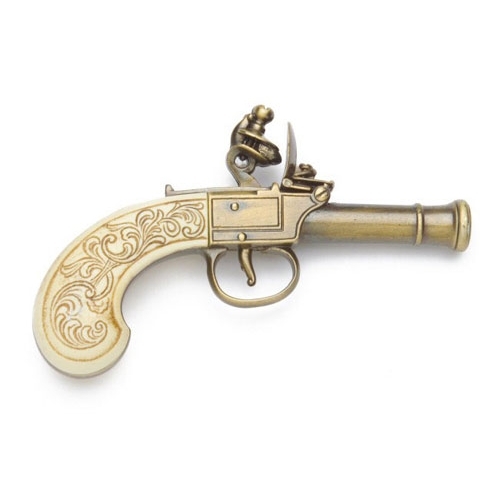 Known as a "Ladies' muff Pistol", this Flintlock pistol is the more elaborate sister model to the Men's Pocket Flintlock and was originally crafted by Bunney of London circa 1770, it has an embossed mock ivory grip and gold-tone barrel. 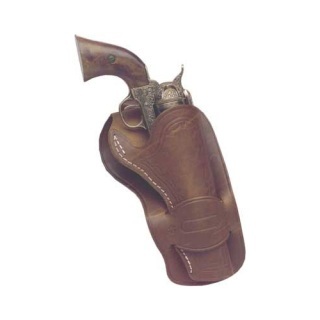 Length: 6", Weight: 14 oz. 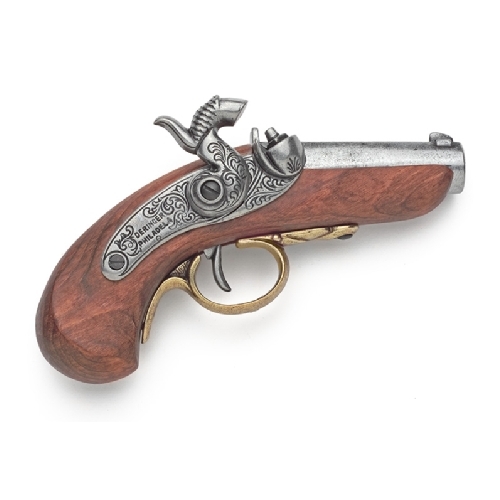 This Gentleman's Pocket Flintlock Pistol was originally crafted by Bunney of London circa 1770. 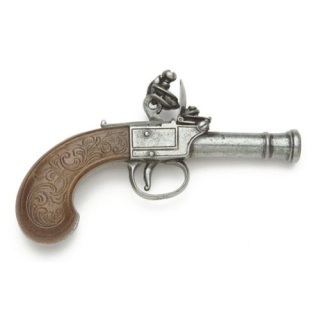 It's smaller design allowed it to be more readily concealed than its larger and more cumbersome flintlock brethren. It has an embossed dark wood grip and time honored appearance. 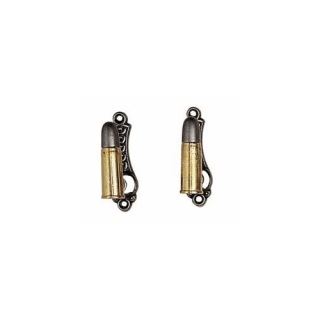 Pair of adjustable wall or plaque hangers. Pair of adjustable wall or plaque hangers. 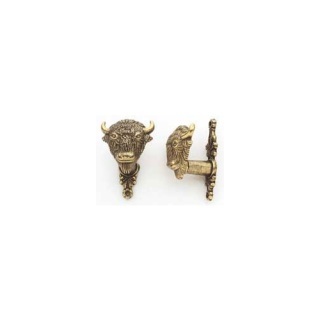 Gold or silver tone. This Mexican Style Fast-draw Holster is a single-loop style leather holster. It was a favorite of John Wayne and was used in many of his movies.